Steps fold over and telescope down. They fold over flat on the platfrom . Flat poly treads for comfo.. 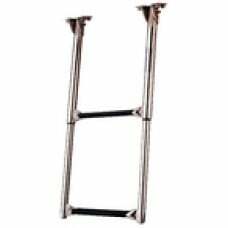 Durable HDPE platform is pre-drilled for easy assembly Mounts at 10 degree angle on transom Ladder s..
71281: Length deployed: 21.5". Length stowed: 13.5". Overall Width: 12". Step Tread: 7.25" x 1.5"713.. Ladder Measurements2 Step: Length deployed: 23". Length stowed: 13.5". Overall Width: 11.25". Step T.. Ladder Measurements2 Step: Length deployed: 24". Length stowed: 14.75". Overall Width: 11.75". Step ..
71221: Length deployed: 23". Length stowed: 13.5". Overall Width: 13.5". Step Tread: 7.25" x 1.5"712..